Whipper snipping the edges of your lawn is not a job anyone really likes, but it is necessary if you want your freshly mown lawn to look tidy. 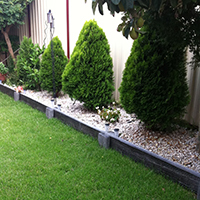 Lawn edging is predominantly functional, but it can also be so much more than just a barrier. This entry was posted in Border Plant, Lawn Edging and tagged lawn edges, Lawn Edging, rock garden edges, tidy lawn edges, timber sleeper edges. Bookmark the permalink.